Always losing your phone charger? Tired of digging for that missing cable? Try these 5 TIPS for managing your favorite home electronic devices. Start by decluttering. Go through your desk drawers, media console, and storage cabinets to gather all your electronics and tech devices, including cords and accessories. Eliminate anything damaged or broken first, then get rid of the old versions of your current devices, like your Bluetooth keyboard or iPhone 4. Do the same with other outdated electronics, like your chunky first iPod or sprawling collection of VHS tapes. Next, get rid of anything you don’t enjoy or use regularly, whether it’s an untouched e-reader or pile of empty flash drives. It’s also helpful to purge single-use devices — like a digital camera or mp3 player — if your phone or tablet has those same functions. Create a plan to safely and swiftly dispose of this unused stuff. Find a charity or organization that provides phones to members of the military or abused women and donate your old phones. Sort your electronics by category, like everyday necessities, computer equipment, household technology, travel devices, back-up materials, or miscellaneous items. Next, match each device with its corresponding charger, cord, or accessory. From there, sort each category of stuff into its own container, and make sure to label each one. To keep things hyper-organized, put smaller items — like earphones, flash drives, or outlet adapters — into cloth ziplock bags and label. As for cords, there are plenty of clever tools to help keep them neat, but household items such as twist ties do the trick just as well. After you’ve finished organizing your electronics, create an inventory list of all your equipment and various gadgets. Use the same categories you used when organizing, and make sure to include important details if you can, like the model number, serial number, or date of purchase. Update this list on an annual basis when you do your annual spring clean! For all the devices in your life you cannot live without day to day like your phones and tablets, you need a couple of designated charging stations. Stop dragging your cords and chargers from room to room and leaving a mess behind. Have at least one central charging station on each floor of living space. Mom of 2 and home organizer Janine Do says "let's start an Anti-Clutter Revolution"
Is there a mom who hasn’t wanted to tear her hair out trying to figure out what to do with the mess that has been created by a life cluttered with electronic devices and kids constantly looking for chargers? While there are products and hacks to organize almost everything in your home, no one has solved the problem of the ever increasing electronic devices, chargers and cables that CLUTTER your home. Phones, tablets, speakers, headphones, cameras, fitness trackers. The list is endless and they all have 1 thing in common. They all need to be charged. The problem. They all have their own cables, stands and chargers. Everything is a mess. No one can find their cables. IT'S MADNESS! We love our electronics, but it's becoming a GIGANTIC mess! We all love a beautiful, neat, and organized home but it simply takes up TOO MUCH TIME! It also doesn't help that the kids and our husbands are constantly accumulating some new electronic gadget all the time...and they leave a trail of messy floors, tables and countertops. 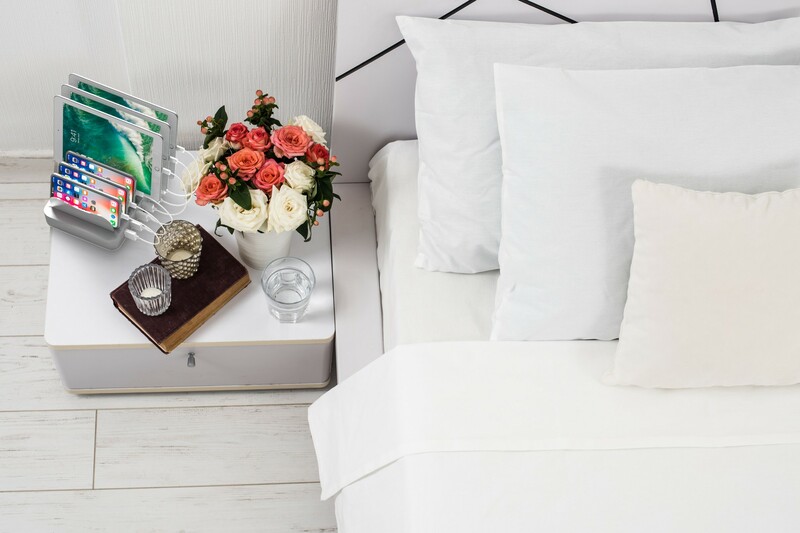 Years ago, our founder, Janine Hang, began what we call the anti-clutter Revolution. It's a worldwide movement to fight against a brand new problem we see in our homes - MESSY CABLES AND PLUGS everywhere for all those new electronics devices that we, our husbands, and our children accumulate. The whole idea behind HERCULES TUFF is simple. A central place to organize and charge your electronic devices. We are parents too and who doesn’t have a house full of cords, plugs and devices to charge. You shouldn’t have to dig through that junk drawer or climb behind your couch to find your charger. Hercules Tuff is filling the gap in home organization. While other companies carry “home organizaton” products, Hercules Tuff is the only company that keeps you “ORGANIZED AND 100% CHARGED!” And we are not the only ones who think a charged phone is a happy home. At HERCULES TUFF, we say “Don’t just charge. Organize. Beautify.” Our charging station is a super multitasker that can replace six messy chargers and cables — and takes up less space than one mini iPad. Hercules Tuff Charging Stations come in 3 different configurations and are customizable with most USB cables. They start at $42 each and sold on the Hercules Tuff website. The Hercules Tuff Charging stations all start with 6 intelligent USB charging ports to charge, store, organize your devices quickly and beautifully. All provided cables are perfectly sized to keep your space neat and organized! 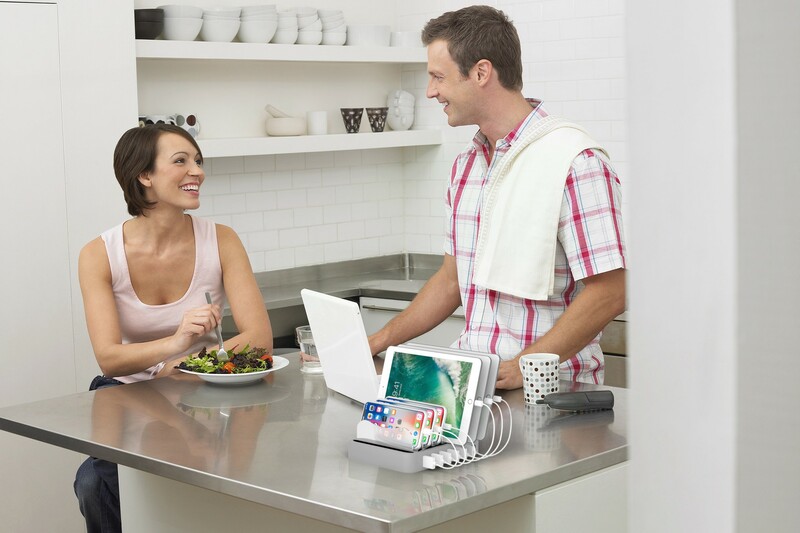 TUFFDOK222 is our best 6-port charging station for families and businesses with mixed brands of electronics. because it includes 2 Apple Lightning Cables, 2 Type-C Cables, and 2 Micro-USB Cables. TUFFDOK411 is our best selling 6-port charging station for families and businesses with mostly Apple devices but still need to charge a couple non-Apple electronics such as an Android phone, bluetooth speakers, headphones or more. Includes 4 Apple Lightning Cables, 1 Type-C Cables, and 1 Micro-USB Cables. TUFFDOK006 is our best 6-port charging station for families and businesses with ALL Apple devices. Compatible with all the most common iPhones, iPads and Apple accessories that use the Apple Lightning cable. Includes 6 Apple Lightning Cables. GREAT CHARGING STATION! Love this charging station! It is so nice to have an organized charging spot for our devices. Love how it came with 6 cords for devices and how it lights up when charging. 1 month later - still loving it! This charging station is so great we plan on getting another one for my mom's house so all the grandkids can plug their devices in one area neatly! So glad we made this purchase! With 5 kids and a million devices, I needed a Spot to hold all of our iPads, iPhones, Apple watches and PS4 controllers in one spot. Seriously, I was about To lose my mind over the “MOM!! He took my charger” and “I can’t find my phone! !” screaming. This allows us a central place to plug everything in and keep it orderly. Especially useful at night when I take all the devices away until morning. It charges everything quickly and doesn’t take up much space. I’m planning on buying another one for the master bedroom and the game room! Try our line of charging stations for multiple devices by Hercules Tuff! You’ll love the way it clears the clutter. Perfect Kitchen Counter Charger - Sorry Kids! Perfect device for a family!!! 9pm phone curfew (all phones in kitchen) was a great family idea, except not enough chargers! NOT ANY MORE!!! Holds Dad's Samsung Tab, Mom's I-Pad, x3 I phones (of all sizes and cases) and Dad's Droid phone... AND CHARGES THEM ALL SIMULTANEOUSLY!!! And I didn't have to even purchase separate cords!!! Join our Clutter Revolution for new videos, organization tips, discount codes, and more!